I have come across more than one app that promises to extend the life of the battery on a users phone. What these apps normally do is close all those resource hogging and battery eating apps which are open in the background. The first app that I used and am still using for this purpose is Battery Doctor. Measure the battery remaining percentage and time. Measure the time required to charge the battery to 100%. Kill apps that are heavy on the battery. Gives you an idea of how much battery you could be saving if you shut down certain features such as wifi. Battery charging report which shows the number of times you just charged, overcharged or fully charged. While the feature list is long, I listed only five because they seem to be the most important ones. What I find really useful about this app is that it plays a certain sound when my charging is full. That prevents me from over charging my battery. The main feature of this app seems to be related to saving power. 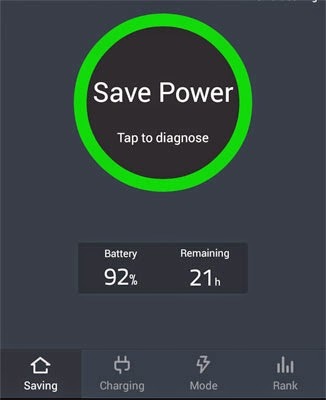 Just press the circle button that says save power and it will provide you an option to shut down those power hogging as well as normal apps running in the background. Although, most of the closed normal apps seems to run quietly in the background again as they are required for notifications, Battery Doctor does close down those power hogging apps. An additional feature in this is that you can also delete junk files from apps to free up disk space. The app also displays a rating on how your performance is. Another important feature of this app that I like is that it records your charging habits. 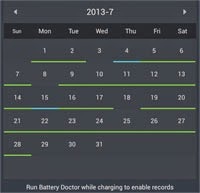 You can see a calendar like view where a certain month is displayed and your charging habit on that month like the number of times you just charged or fully charged is displayed. The report may not be that useful to many but is quite a neat feature. What I do not like about this app is that it is always in the notification panel of the phone. But overall the app is great and its users think the same. The app is quite popular at the Play Store with 1,000,000 - 5,000,000 downloads as of now. The app is also rated 4.6 stars by its users. So download and use this free app if you need to manage your battery life better.